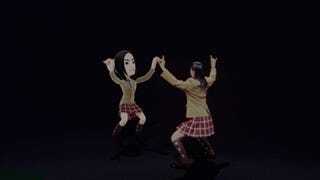 Two girls from SKE48, a spin-off act of Japan's most popular female group, are appearing in Kinect television spots. The U.S. might be just now getting what's apparently a Kinect ad, but Japan is already on its second! Both "Future Report" ads look like late 70s - early 80s science programs and differ significantly from the angle Microsoft is taking in the U.S. Both regions play up how players use their bodies. The hook, however, in the West is "You are the controller," while Japan is going with a "There's no controller?!" tagline. That, and schoolgirls. In this spot, SKE48 member Jurina Matsui is supposedly doing "radio taiso", but it's actually a series of funny poses, including wrestler Keiji Mutoh's iconic gesture.